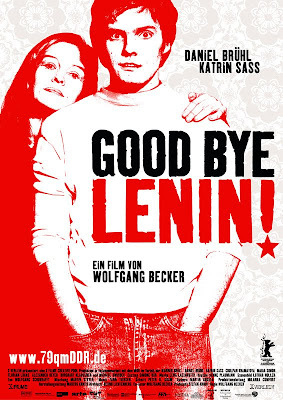 In what I consider to be one of the most original and entertaining concepts for a screenplay, Good Bye Lenin directed by Wolfgang Becker, chronicles the rapid change in East Germany after the Berlin Wall falls and western ideology invades. While you may be thinking this sounds like a history lesson, the real twist is that it's about a woman who falls into a coma before the wall came down and wakes up after the bulk of the change has occurred. The story centres around Alex, played by Daniel Bruhl, whose mother is the woman in the coma. Due to her fragile heart and weak condition she's bed-ridden and doctors warn that any shock could do her in - clearly an issue when almost nothing is the way it was. 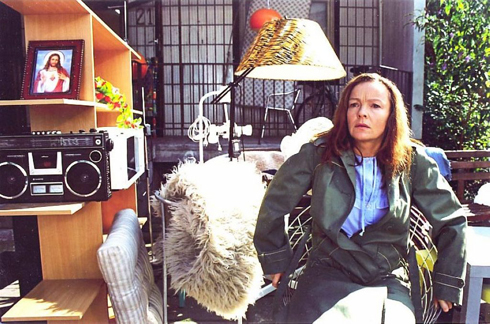 Becker's film takes place in East Berlin which gives us a front row seat to the sweeping changes that occur while Alex's mom is out. For a young guy in his twenties, the shift is both energizing and overwhelming. The invasion of western culture is initially revealed tongue and cheek (hey, look at all the choices in the supermarket now!) but the onslaught becomes a burden to Alex's situation and creates a strong message for how despite the new found freedom, it wasn't really the Godsend promised either. To keep his mother stable, Alex retrofits her flat back to its East German glory - from the nightstands to the curtains and various Communist paraphernalia. In her weakened state Alex's mother's room becomes a microcosm of the country that was. Although, finding her old favorite foods is now made more difficult when the single brand she had been used to has been replaced with an entire row of options - ironically, all the wrong options for Alex's predicament. Becker's film, while both lighthearted and upbeat, is actually quite successful at examining this defining moment in German history. The situation that Alex finds himself in gives him the opportunity to create the best of East Germany for his mother, the country that it was supposed to be, the country that he never really understood like she did. There's optimism in the message, reminding everyone that it was supposed to be so much better than what had become of it. I think it's easy to historically classify East Germany or the GDR as intrinsically evil (especially if you're from the West). With a communist government, they were a rival for just over 40 years after all. However, what Good Bye Lenin does so successfully is highlight the ordinary people behind the system who were really just trying to live their lives as happily as possible. Let me make it clear, Becker doesn't make excuses for the country or the powers that were, but instead he paints a picture that contrasts the ideologies from an East German perspective. The film explores how in many ways the invasion of consumerism and a free market really just created a new form of disparity - further emphasizing the radical transition. Imagine being in East Germany and suddenly seeing western business take over, the range in selection, the quality and choice increase. At the same time, picture the tackiness of it all, suddenly Burger Kings and Coca Cola everywhere you look, secure government employment replaced by minimum wage retail positions, and a shift in thinking from 'the good of the people' to the consumer driven 'me lifestyle'. While there are significant flaws in both systems, the point is that neither side got it right. And while the west paints the end of the GDR as a victory, the film simply suggests that being East German didn't mean or doesn't mean that your history isn't worth valuing. It's both hilarious and heartbreaking to see Alex cope with his mother's condition, hiding the truth outside, and maintaining the reality he's created inside. He goes as far as filming fake news reports, and getting the neighbours and old friends to go along with the lie. It's a human story that reminds us of the values that we should uphold no matter what the system of government. 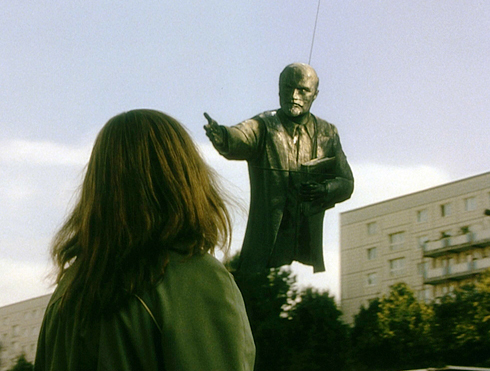 At it's heart, Good Bye Lenin is really about moving forward. Alex's story is about paying tribute to all those who had their lives turned upside down in the chaos. It's about giving East Germany, and all those people who grew up there knowing nothing else, a send off, a glimpse at what it was supposed to be, and perhaps most importantly, recognition of a new unified German history for a country that's only been re-unified for twenty years now. Good Bye Lenin! is a charming, funny, and unique movie that brilliantly incorporates the chaos and excitement that surrounded the end of the Cold War. It's no wonder that it's regarded as one of the revival films for German cinema. Whether you're in the mood to just kick back or sink your teeth into something a bit heavier, Good Bye Lenin seems to balance these traits with the best of them. Simply, the Cold War never seemed quite so wonderfully innocent. Good review. I watched this movie for the first time and loved it. Also made me a huge fan of Daniel Bruhl.